Phoenix Park, Dublin. Photograph taken at 1604 on 29 November 2016. Around this time of the year, I get quite obsessed with the time at which it finally gets too dark to walk my dog. Like many other Dublin dog-owners, I go to the Phoenix Park (a few minutes drive from my house) for her afternoon excursion. It has acres of space in which to walk and often several other dogs with whom mine can run around, so there is much to commend it. 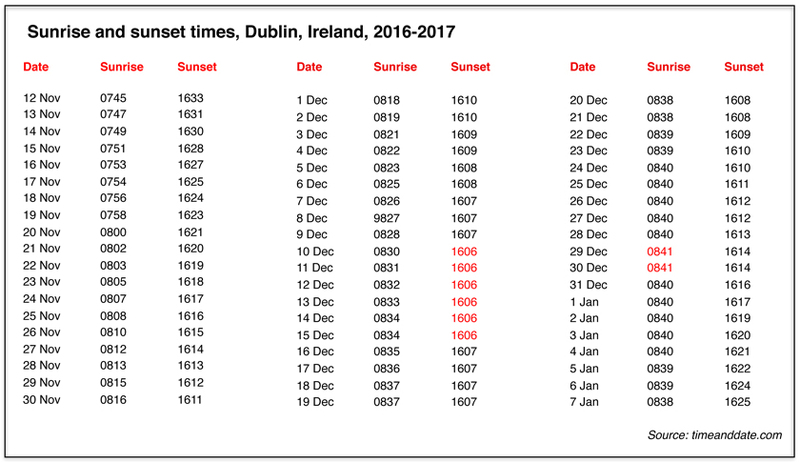 The most noticeable things in this table are the times I have highlighted in red: the earliest sunset times actually occur between 10 and 15 December, more than a week before the Winter Solstice on 21 December. The 21st may well be the shortest day of the year, but by then sunset has already advanced by two minutes, and the latest sunrise will actually occur eight or nine days later on 29/30 December. So why does this occur? As you would expect, Timeanddate.com has the answer: it is apparently because of a phenomenon called The Equation of Time as well as a location’s latitude. At the time of both the Winter and Summer Solstices, the length of a solar day (as measured by a sundial) is longer than 24 hours (as measured by a clock). This explains the discrepancy, and has a pleasant consequence for us dog walkers. By Twelfth Night on 6 January, the sunset time has already advanced by 18 minutes over the earliest time. As they say over here in Ireland, we will be beginning to notice the stretch in the evenings by then.